One of the greatest challenges for decision makers—and for all of us, even in our everyday lives—is that the urgent usually takes precedence over the important. Broken rails on a railroad will be fixed before general maintenance is done. A government will take care of feeding families starving from famine before it revamps agricultural policy. Parents will rush to the emergency room to set a fractured leg, only afterwards considering vitamins might be needed to strengthen weak bones. It seems we can always find funds to take care of things that absolutely need it right now, but there isn’t always money left to make improvements that might reduce the incidence of those emergencies in the future. When faced with an emergency, the solution may seem obvious, but usually there are also alternatives that are not considered. These options could have more wide-ranging and longer-lasting impact on the problem we face. In order to make better decisions and plan for the future in the face of limited resources, we must be able to see the full picture. At ReThink Health, we encourage leaders to build a cohesive picture of their entire health “ecosystem.” This requires the full range of major institutional stakeholders in a community to develop a shared view of the ecosystem, including how it is comprised and why it is delivering the results it is. Through the process, leaders expose inherent tradeoffs in their choices and can better appreciate the full array of options at their disposal. This ecosystem extends far beyond the traditional health care paradigm to improve not just health outcomes but a region’s entire well-being. An ecosystem perspective is essential to any truly transformational effort; if stakeholders begin making decisions about how to change things without first understanding the whole, they are bound to miss opportunities for significant change. ReThink Health has developed a number of resources to help leaders see the entirety of their health ecosystem so that they can begin to figure out how to best transform it. In this post we focus on the strategy portfolio exercise (aka the pie chart exercise), which can be used by multi-sector partnerships to align around a shared understanding of the “current view” and explore new ways to create a “better view” of their health ecosystem. Building on ReThink Health’s Dynamics Model, a computer-based simulation that anticipates how a health system might respond to changes, the strategy portfolio exercise extends even further beyond the typical health arena. It explores a more comprehensive set of factors that influence a health ecosystem and includes 17 different “strategy portfolio options” representing a wide range of possible investments, policies, and initiatives that address both “urgent needs” and “vital conditions.” Urgent needs, such as homeless services and unemployment assistance, attend to immediate shortfalls in vital conditions that are necessary for well-being, such as stable housing and jobs, wages, and wealth. The full list of options to consider is summarized in the figure at right. A region’s strategy portfolio represents all of the areas it might focus on as it pursues health transformation. 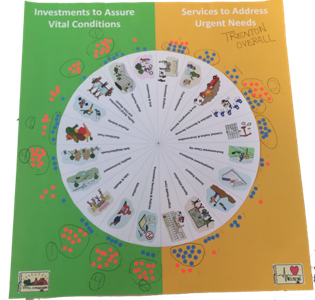 In creating their “pie,” leaders develop a physical picture of all the vital conditions and urgent services currently present in their community and explore how it should shift in the future to deliver better results. This picture paints the broad strokes of a theory of change for regional transformation–both as it is playing out now and as it might be improved for better health outcomes. During recent meetings, we’ve had an opportunity to explore the exercise with leaders from our six Ventures sites. First, team members from each community distributed blue stickers across the 17 different portfolio options to represent their perceptions of the current allocation of their region’s resources. The team then placed red stickers to indicate how they believed resources should be redistributed to promote true advancement of population health in their region . Overall, the leaders envisioned substantial efforts to shift resources from urgent services to vital conditions. Trenton (New Jersey)’s effort was fairly representative. 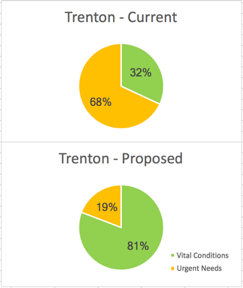 Trenton’s stakeholder team estimated that 68% of current resources were being used to address urgent services–particularly medical care, criminal justice and incarceration, and addiction services. It would be better, they agreed, if urgent needs consumed less than a quarter of the community’s resources. Across the board, the Ventures teams perceived that their communities are over-reliant on urgent services, and like Trenton, they expressed a preference for urgent services to use less than 20% of resources in the future. This would leave 80% of resources to be invested in vital conditions such as jobs, wages, and wealth; stable housing; and education. 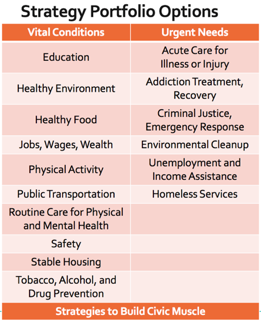 The overarching theory is that if we can invest in vital conditions, we will see a return in reduction of urgent services. All participants believed there is a substantial opportunity to reduce the costs of urgent services, especially for criminal justice, emergency response, and acute care for illness or injury. Addiction treatment and recovery was the only outlier; while an urgent service, leaders believed more resources should be devoted to it. These stakeholders agreed that shifting resources from urgent services to vital conditions will help to reduce costs in the long term while achieving gains in multiple areas. The leaders agreed that stable housing and jobs, wages, and wealth are the most important vital conditions to support. They agreed that building civic muscle—the power of ordinary people to shape their common world—is critical. Most Ventures teams felt that while initiatives to ensure healthy environments, healthy foods, and physical activity were important (efforts the ReThink Health Dynamics Model shows are important), shifting some of the resources currently spent on these to address the other vital conditions named above in #3 is ideal. Several of the Ventures communities have since used the strategy portfolio exercise back at home. The Central Oregon Health Council repeated it twice, first with their core Ventures team and then with their board of directors. The exercise prompted a lively discussion about how increasing addiction treatment and recovery services can reduce the drain of criminal justice and emergency response services and how increasing jobs, wages, and wealth can reduce the need for unemployment and income assistance, and, in tandem with routine care for physical and mental illness, can serve to reduce acute care for illness or injury. 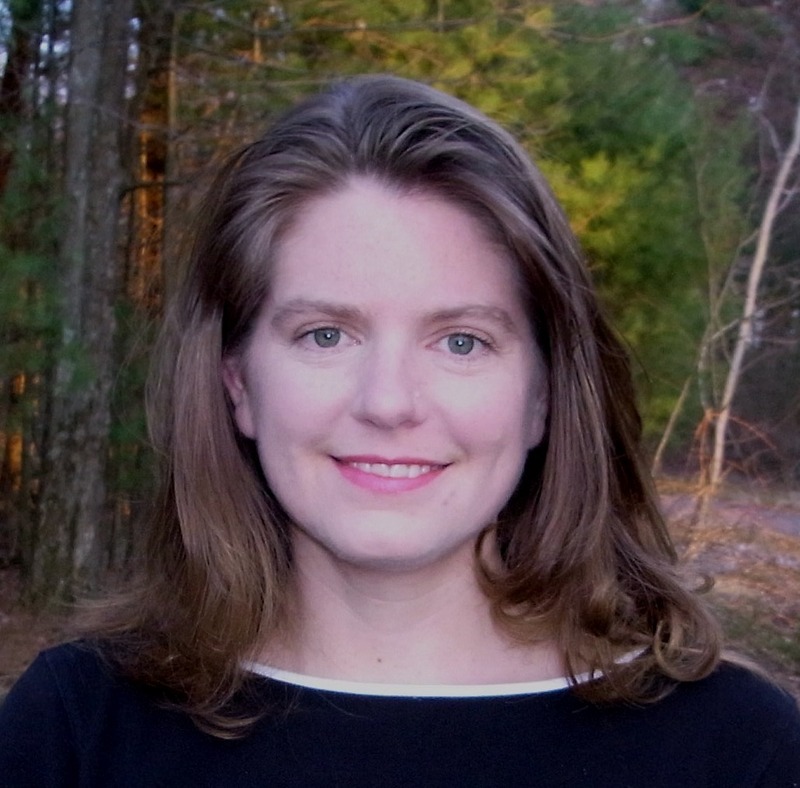 This exploration of the systems connections and relationships helped to illuminate the need to build collaborations with people beyond the usual suspects within health. And in Bernalillo County (New Mexico), team leaders noted that the exercise changed the experience of meetings for participants. Breaking the norm of presentations and encouraging full group discussion resulted in an entirely different conversation—one in which everyone had a voice, even those who had rarely or never spoken up before. This enabled a new level of engagement and contribution by participants. 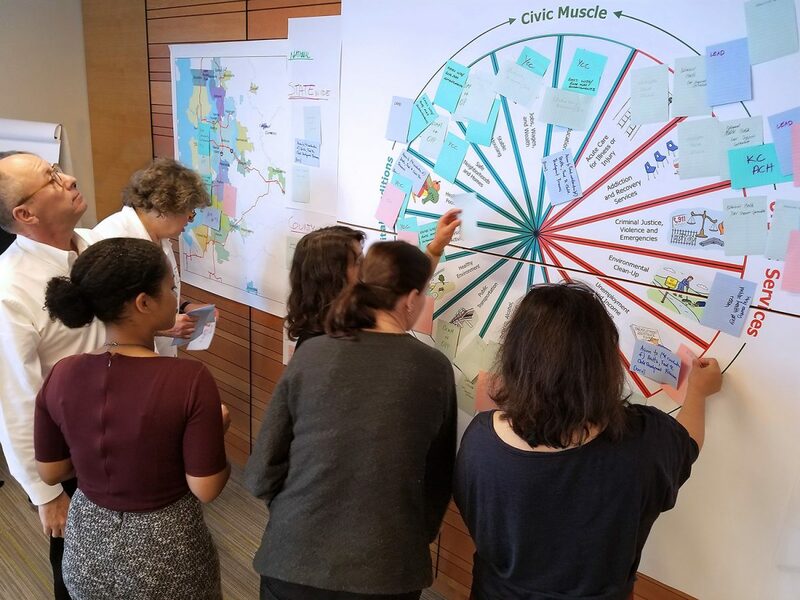 In King County (Washington), the exercise led leaders to a mandate for greater interconnection across more than 35 major initiatives in the region. The pie chart exercise is serving many purposes—helping team members see the value of working together to agree on priorities and enabling conversations that might not otherwise be had. You too can have a slice of the pie by downloading the strategy portfolio exercise materials and following the instructions provided. And if you try it out, please let us know how it works for you at ThinkWithUs@rethinkhealth.org.